Save $300 instantly on the Dell Inspiron 13. Get $50 off savings on select Xbox One S consoles, plus a free game. HP laptop only $529. Save on a 15-inch laptop with Intel Core i3 and 1TB of storage. HP Laptop 15 with 7th Gen Intel Core i5 processor for only $679 CAD. $220 off Dell inspiron 15 laptop, front facing gaming laptop now only $929 CAD. Save $400 off Dell Personal Computer XPS 13 laptop with Intel i5 processor. Score huge savings up to 50% off on select Xbox One games. 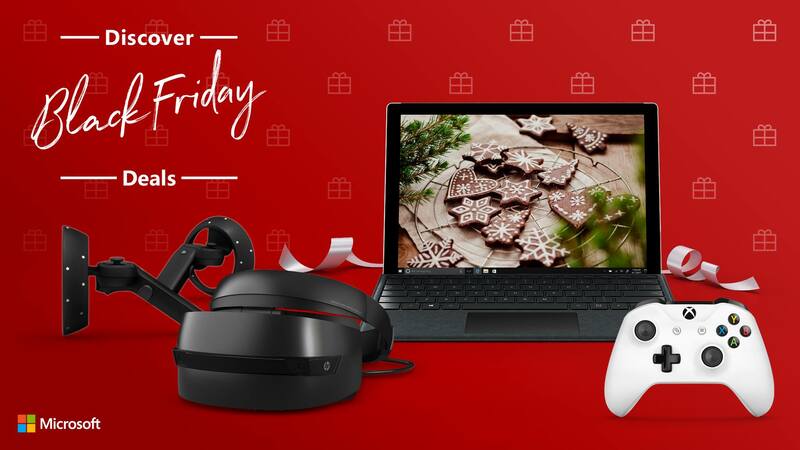 Whether you’re buying for a gamer, a social media maven, a budding photographer, a fitness fiend or someone who just wants to stay connected when it matters most, Microsoft’s Black Friday deals put the latest technology within reach – and within your budget. These deals ara available while quantities last, until November 27 2017. Microsoft Canada offers FREE shipping on ALL orders, as well as free returns. Click here to view all of Microsoft Canada’s Black Friday deals.